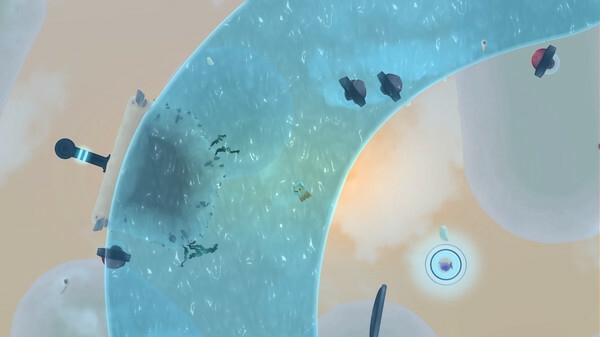 Airscape: The Fall of Gravity is a fun little platformer that makes clever use of physics to allow you to move around. Here’s our review. It seems that puzzle platformers are a dime a dozen these days, but it’s much harder to find a pure platform experience. This is somewhat surprising, considering the success of the last two Rayman titles and the quality that smaller studios can deliver in games like Giana Sisters: Twisted Dreams. You’d also think that development would be a bit easier if you didn’t have to worry about designing complicated puzzles time after time as well. While Airscape: The Fall of Gravity does contain puzzle elements, it is much more of an old school platformer than recent hits like In Between and Blackhole. Similar to many platformers of the past, Airscape: The Fall of Gravity also features a very cute and colorful art style, one in which you take control of a little octopus character who is most comfortable in water but who has to venture onto land and into the air when mechanical creatures from outer space invade his home and kidnap many of his friends. Saving them will require leaving the safety of your watery home and traversing the many patches of land and obstacles that now seem to be free-floating up in the air. Each patch of land has a gravity core, so when you jump from one surface to the next your perspective might shift 180 degrees to accommodate your new surroundings. Because a lot of the ground you travel on also isn’t exactly flat, you’ll find yourself (and the screen) twisting and turning without these jumps as well, making Airscape somewhat of a mix of the rollercoaster rides that the old Sonic games offered and the tricky jumping sequences found in many other platformers. This process becomes increasingly complex when both water and land surfaces are involve, as you react differently to them. In water, you can move around freely, and you can also use gravity to your advantage by diving down and generating uplift as you come back up for a jump towards the next area you want to reach. Needless to say, gravity and physics play a major role here. The controls are responsive and smooth, and the gameplay experience is much more skill-based than it is puzzle-based. There are also plenty of ways to die, and your best line of defense is to just avoid contact altogether – no head-jumping here. Besides traversing the colorful levels, you also have to make sure that you save plenty of your buddies along the way. This is – in some cases – easier said than done, because ‘impossible’ jumps and cleverly placed bad guys are standing in your way. We enjoyed Airscape: The Fall of Gravity. Despite looking somewhat overwhelming to onlookers, with its twisting and rotating game world, it’s an accessible platformer with a gentle enough learning curve. It may not be the most memorable of games, but it’s different enough to warrant a healthy dose of interest from fans of platforming games.